CARICOM Today:- The Caribbean Community (CARICOM) is seeking to re-introduce the single security check for direct transit passengers on multi-stop intra-community flights. He was at the time speaking at the opening of the International Civil Aviation Organisation (ICAO) Air Transport Conference on 21 November 2018 at the Guyana Conference Centre. CARICOM had successfully implemented a single security check initiative during the Region’s hosting of the ICC Cricket World Cup in 2007. With a pause in that arrangement, intra-regionally travellers making transit stops are required to go through security checks until reaching their final destination. 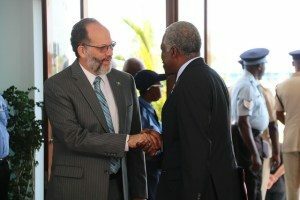 Secretary-General LaRocque told the meeting that under the auspices of the Caribbean Aviation Safety and Security Oversight System (CASSOS), work will soon commence on the development of a regional policy, through which the single security check would enhance travellers’ experience in the Region and minimise inconvenience. CASSOS which was formally launched in 2009, has been facilitating growth and development of the regional aviation sector through training, resource sharing, and harmonization of policies and procedures, among other areas. CASSOS’ Member States seek to uphold the highest standards of safety and security in aviation, as determined by the Rules and Regulations of the ICAO, the Secretary-General told the Meeting. He said the actions CARICOM has been taking were not limited to its domestic situation, but was also in pursuit of enhancing global transportation links with the consequent benefit to the regional tourism product. In this regard, he said a consultancy has been launched to formulate a Regional Airlift Policy and Strategy, with technical reviews, analytical work, along with stakeholder consultations in Member States already undertaken. The objective of the Regional Airlift Policy and Strategy, Ambassador LaRocque said, is to harmonise aviation policies in the Community and support the expansion of the tourism sector as a major contributor to the sustainable growth of Member States. Noting that those objectives have key linkages with the objectives of the Air Transport Conference, he said that the presence of the Honourable Joseph Kofi Adda, Minister of Aviation of Ghana, and Her Excellency Dr. Amani Abou-Zeid, Commissioner for Infrastructure and Energy of the African Union Commission, presents an opportunity to explore possibilities for air links and consequent increase in travel among the African diaspora. The International Civil Aviation Organisation (ICAO) Air Transport Conference at the Guyana Conference Centre advanced the outcome of a Special Event on Promoting Air Links between African States and the Diaspora which was held in Accra, Ghana in 2017. The Secretary-General, in emphasizing the vast potential for improving tourism and trade between linkages between the African continent and CARICOM Member States, encouraged the Meeting to advance those prospects. Dr Amani Abou-Zeid in her remarks to the opening of the Conference invited Ambassador LaRocque to discuss connecting the Caribbean and the African continent. Underscoring the immense potential of this collaboration, she said that Africa’s population is expected to double to 2.5 billion people by 2020 and the African diaspora is estimated at more than 150 million with 23 million in the Caribbean alone. IT is over due, yes put an end to this nonsense!